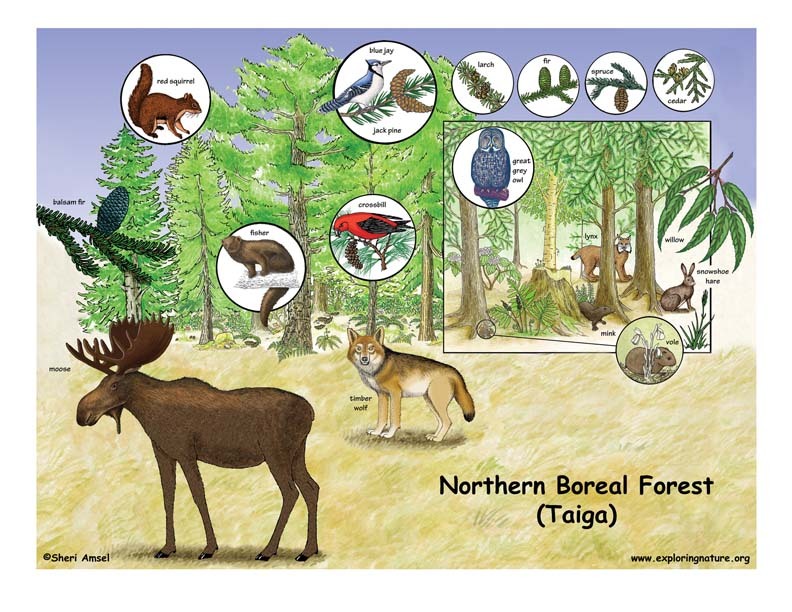 Northern Boreal Forests spread across Canada through central Alaska, northern Asia, Europe, Russia, Scandinavia and Northern Scotland. They are considered circumpolar as they wrap around the northpole, south of the tundra biome. As you travel north, the forests change. From the deciduous forests of maple and oak they turn into forests of mostly conifers. Now you have entered the Northern Boreal Forest. 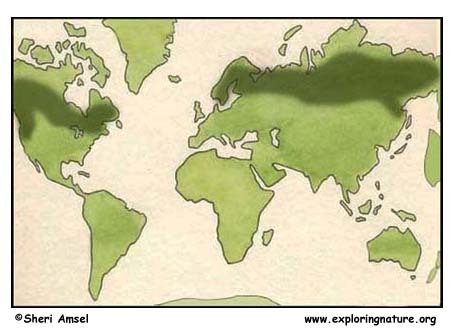 These forests are vast and make up 1/3rd of the world's forests. It is the largest biome by far and called the Taiga. These are not mountainous areas, but high flat or slightly rolling plains. The forests here tolerate long, cold winters with minimal rain and snow. Warm, wet weather fronts rarely reach these conifer forests. Even so, there are wetlands in the Taiga. It is not unusual to find swamps, marshes, bogs, rivers, and lakes here. (Taiga is Russian for swampland.) In some places, in the far north, bogs stretch for miles covered with this sphagnum moss. Sphagnum moss will grow over small ponds in a thick mat. This is called the muskeg. In these northern reaches, the permafrost stays frozen just a few inches below the surface of the soil. Only in the summer does that top few inches of soil thaw. It is a thin, acidic soil that supports only a few species of trees and plants. Though cold for much of the year, there are many animals that make their home in the taiga. Black bear, moose, elk, lynx, snowshoe hare, caribou, wolverine, fisher, beaver, pine martin, mink, ermine, timber wolf, red squirrel, lemmings, and voles can all be found here. Because of all the standing water, there is an intense insect season. This, in turn, provides food for dozens of species of birds, like swallows and warblers that come here in the warm months to breed. Seed eating birds, like grosbeaks, finches and crossbills feed on the abundant seeds made from the endless supply of conifer cones. This forest has fewer types of trees than a deciduous forest. 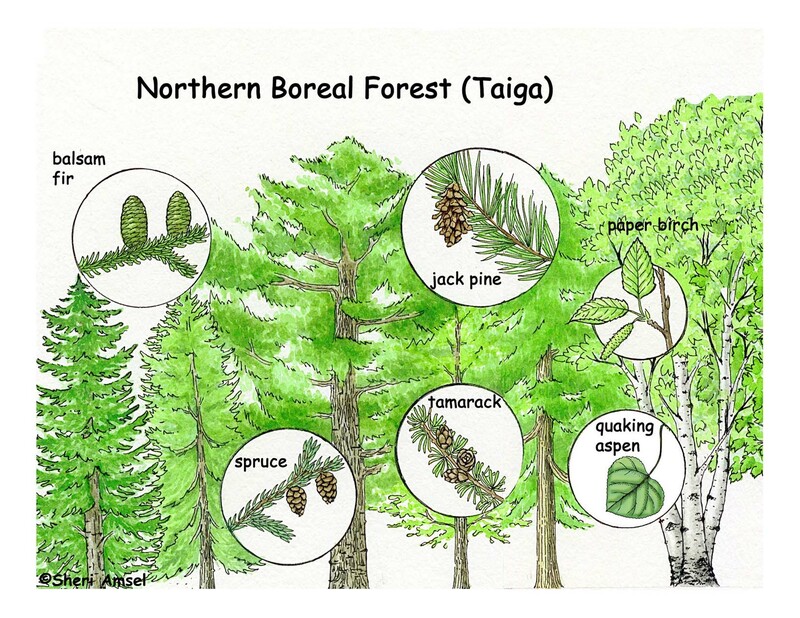 It has mainly black spruce, tamarack, balsam fir, paper birch, alder, jack pine, and quaking aspen. Underlying the trees are shrubs, mosses and lichens. This is a good climate for sphagnum moss that stores water like a giant, green sponge. Over time, compressed layers of sphagnum moss form peat. 1. How are coniferous trees different from deciduous trees? 2. What kind of trees grow in your yard? Use the Coniferous Tree ID Sheet (above) to identify coniferous trees in your yard or neighborhood. 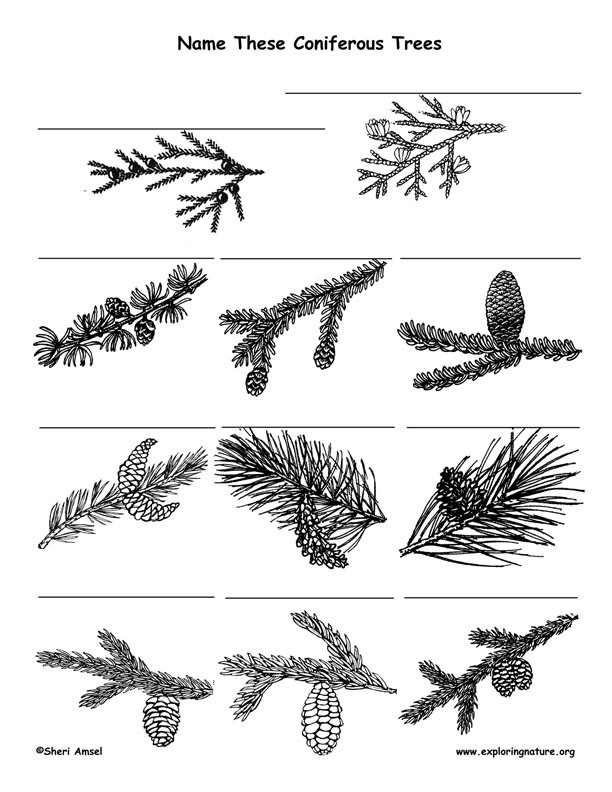 Or with help from an adult, use the dichotomous key (in PDF below) to identify your trees. 3. 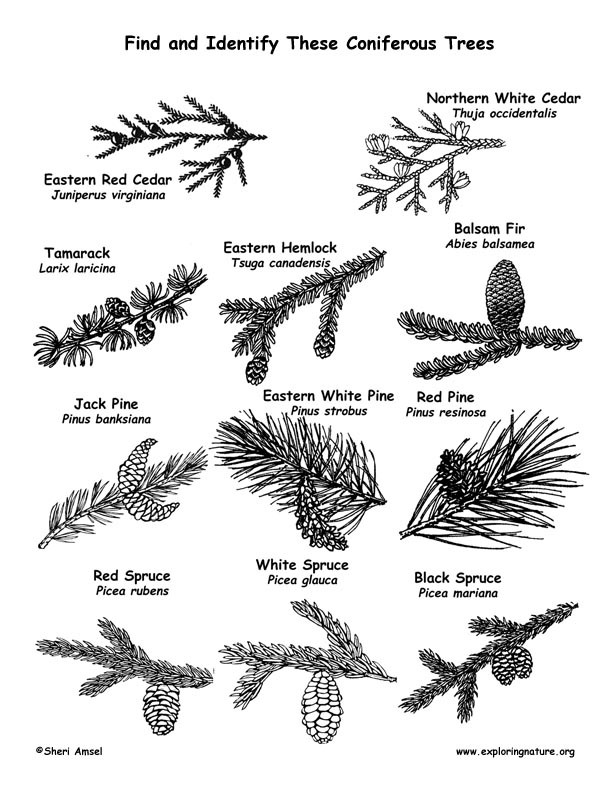 Try the coniferous tree labeling sheet (above). 4. What kinds of animals do you see in and around the coniferous trees? Why do you think small mammals live in or near coniferous trees? 5. Name three things in your house made from trees. 6. Name three other uses for wood.